DUBAI, United Arab Emirates — Canada’s MDA Corp. on Feb. 28 said it would await a decision on a contract bid to the U.S. Defense Advanced Research Projects Agency (DARPA) before deciding whether to shelve its work on a vehicle to service satellites and perform other chores in orbit. MDA also said it expects at least one large telecommunications satellite order this year from Russia in addition to the two satellites it is already building. 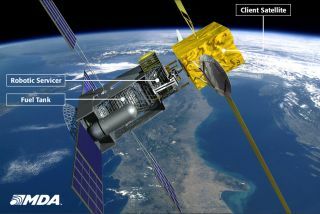 Richmond, British Columbia-based MDA, in a conference call with investors, said that despite pressures on the U.S. Defense Department’s budget, the company’s sale of Radarsat-derived Earth observation products shows no signs of being reduced. “We are a small player in the U.S. budget and so the cuts won’t necessarily affect us,” MDA Chief Executive Daniel E. Friedmann said. “We are cost-effective. At the moment, the budget pressures are helping us and we have a good pipeline” of orders from U.S. government agencies. MDA’s Canadian government business is also being maintained in terms of the sale of Radarsat 2 services, but the government’s hesitation with respect to a follow-on Radarsat system, called Radarsat Constellation Mission (RCM), is pushing MDA into a position where it may need to cut its payroll. MDA Chief Financial Officer Anil Wirasekawa said during the call that MDA booked about 20 million Canadian dollars in RCM revenue in the last three months of 2011. When the program began, full construction was scheduled to begin in January of this year. For its entire geospatial division, MDA reported revenue of 30 million Canadian dollars for the last three months of 2011. MDA is making a push to become a prime contractor of telecommunications satellites. It has a contract valued at about 240 million Canadian dollars with the government of Ukraine to build a satellite, a contract that has been slowed by Ukrainian authorities’ difficulties in coordinating the satellite’s frequencies with neighboring spacecraft. Friedmann said the contract is now back on track but that the hardware construction phase has not yet begun. MDA is also providing the Express AM5 and Express AM6 satellites to the Russian Satellite Communications Co. under a contract valued at more than 200 million Canadian dollars. Friedmann said the company is confident of booking another Russian telecommunications satellite order by this summer. MDA and satellite fleet operator Intelsat of Washington and Luxembourg have ended an agreement under which Intelsat would pay some $280 million for MDA to refuel several Intelsat satellites in orbit with MDA’s Space Infrastructure Services vehicle. Friedmann said MDA has responded to DARPA’s request for bids for a vehicle that would perform multiple services in orbit including refueling. He said DARPA has indicated that non-U.S. bids would be welcome, and that MDA has responded both through its U.S. division and directly as a Canadian entity. He said DARPA has asked that bidders include in their proposals a plan to commercialize the vehicle. NASA has said it too will issue a request for bids for a robotic vehicle capable of visiting satellites in orbit, but that only U.S. bids will be permitted. MDA will bid solely through its U.S. division. MDA continues to seek acquisition opportunities in the United States, and is also moving to replace its Special Security Agreement with the U.S. government with a Proxy Agreement, which company officials say should make it easier for MDA to win U.S. government contracts. Friedmann stressed, not for the first time, that the Canadian government’s internal debate on space funding levels has already dragged on so long that MDA is losing what it viewed as a leading position in space robotics. Its position as a leader in radar Earth observation is also under threat because of the RCM delays, he said. For the 12 months ending Dec. 31, MDA reported revenue of 761 million Canadian dollars, up 11 percent from the same time last year. Operating earnings for the year were 805 million Canadian dollars, down 6 percent from a year ago in part because the Russian order is moving through to production, Wirasekawa said. Operating EBITDA, or earnings before interest, taxes, depreciation and amortization, was 194 million Canadian dollars, or 25 percent of revenue.